"The Digital Marketing Agency eCommerce People Love..."
"Learn Why We're Trusted with +$20m in Ad Revenue." "Because You Really Put $'s in the Bank... Not %'s." "Conversion GIANT has been featured in places like these…"
to Improve Your Website & SEM Campaigns which will generate you More Conversion Profit now and in the future. 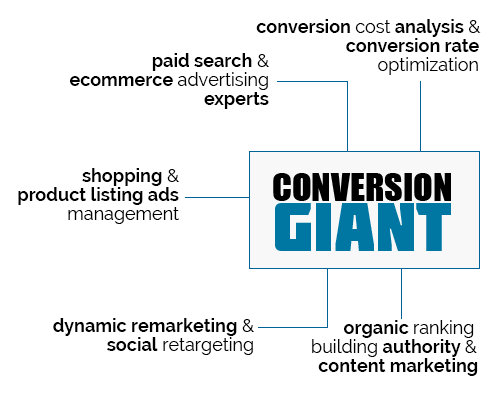 Why They Choose Conversion Giant? Conversion Giant is a full-spectrum Digital Marketing Agency in Los Angeles that focuses on advertiser profitability and growth. We specialize in conversion strategies for both eCommerce and lead-based companies. 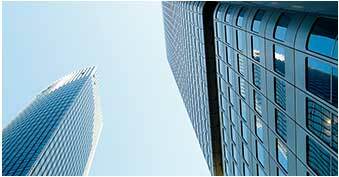 Most importantly, we match your unique company objectives to the best possible solutions so you get results faster. We’re a team of agency experts… geared to drive more conversions, profit, and lifetime customer value through your digital marketing. "Working with Conversion Giant has been a great experience ever since the first contact (which happened to come in the form of a cheesy, home-maid spoof video that helped break through my thick skepticism of all people trying to sell me things). After talking with the sales team I decided to give them a try and it has worked out even better than I hoped. Conversion Giant is the real deal! A great deal of the success of our partnership can be credited to our amazing campaign manager. He is always curious and asking questions about our business so he can figure out what is important to us beyond the statistics. We communicate regularly and practically every time he comes back with new ideas on how to improve our campaigns. I give him a budget and some KPIs and he meets or exceeds those goals regularly and still looks for areas of improvement. The best thing I can say about CG is that I trust them to manage our PPC campaigns which gives me more time to focus on the things I need to do to run a successful business. Thanks Conversion Giant!" "I wanted to send a note about Carl Weber, our own “Paid Search Conversion Giant”. HE has done a tremendous job for us, and he keeps getting better. He’s always responsive to our requests, and willing to do what it takes to make our PPC investment bring us high conversion rates. For instance, from 2015 to 2016, our number of buyers (conversions) for The Texas Steak Warehouse grew 60%! I attribute much of this growth to Carl’s talent, abilities, and hard work. What else can I say, except he deserves a raise!" "Conversion Giant’s outstanding team of professionals proactively manage our account. They communicate often and clearly the steps they are taking to increase sales while lowering costs." "I received a hokey little video in the mail one day that caught my eye. In short, it was about taming the Google Adword Machine. I watched it and appreciated the content it conveyed because I identified with it. The message was that Google was a giant machine which was complex and difficult to master. We definitely needed help and Google's assigned rep wasn't the solution. We have a niche' market selling zip lines and we'd previously done really well with Adwords. Because of our long history of trial and error using Adwords, we felt like we had zeroed in on a good method and put the entire program on auto-pilot for several years. After running some analysis numbers, it turned out we were doing a terrible job with our return on investment, but we never imaged that it was user error (us), we thought this was due to the seasonality of our summertime business or market saturation. 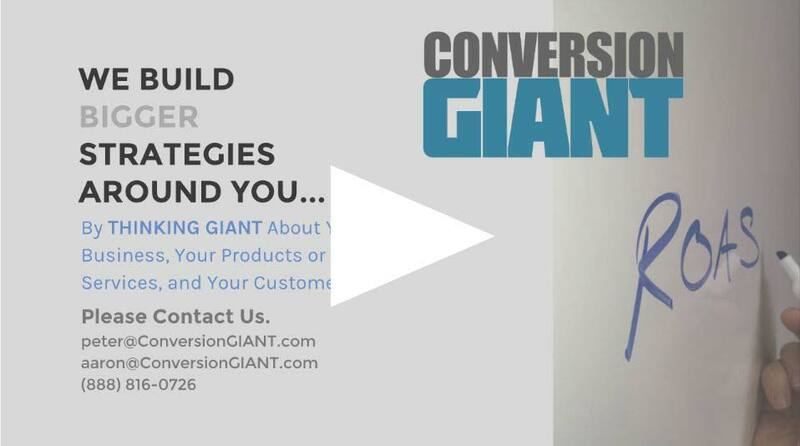 After watching the movie, I chatted with Conversion Giants and we decided to give them a try because they didn't have contracts - they really wanted to earn our business each month - plus their rates were reasonable. We gave them the keys and within one week we saw a dramatic difference with our ROI. While on auto-pilot, every dollar we spent on advertising, we gained on average of 6 in revenue (1:6) during the slowest month of the season. The same week we on-boarded Conversion Giants, we saw those numbers jump to 1:22. The average settled into 1:16 for the rest of the year. I would recommend this company! It's small enough that you get great customer service and big enough that if somebody goes on vacation, you can still make changes to your account. In fact, anytime we have needed to change our budget up or down, our account rep is Johnny-on-the-spot and emails me within a couple of hours." Thinking Big About Conversions. Thinking GIANT About Business.